October 24th; on this day in 1969, Butch Cassidy and the Sundance Kid, starring Paul Newman and Robert Redford as a team of bank robbers in the Old West, opens in theatres around the United States. 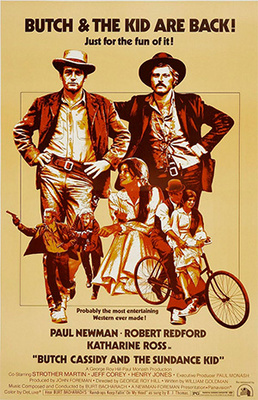 The film was a commercial and critical success, receiving seven Oscar nominations (including Best Picture and Best Director) and winning in the categories of Best Screenplay (William Goldman), Best Song (Burt Bacharach’s “Raindrops Keep Falling on My Head”), Best Score and Best Cinematography. Prior to Butch Cassidy, Paul Newman, who was born on January 26, 1925, appeared in such films as Cat on a Hot Tin Roof (1958), The Hustler (1961), Hud (1963) and Cool Hand Luke (1967), each of which earned him a Best Actor Academy Award nomination. He teamed up with Redford again in 1973’s The Sting, which collected seven Academy Awards, including Best Picture. The famously blue-eyed Newman went on to star in such movies as Absence of Malice (1981) and The Verdict (1982), both of which earned him Best Actor Oscar nominations, and The Color of Money (1986), for which he took home his first Best Actor Oscar. He received Oscar nominations again for his performances in Nobody’s Fool (1994) and Road to Perdition (2002). The screen legend died at the age of 83 on September 26, 2008, after battling cancer. Redford, born on August 18, 1936, made his breakthrough performance on Broadway with Barefoot in the Park in 1963. Following the success of Butch Cassidy, he starred in such movies as The Candidate (1972), The Great Gatsby (1974), All the President’s Men (1976) and The Natural (1984). Redford made his directorial debut with 1980’s Ordinary People, which won four Oscars, including Best Director and Best Picture. Redford went on to helm The Milagro Beanfield War (1988), A River Runs Through It (1992) and Quiz Show (1994), which received four Oscar nominations, including Best Director and Best Picture. Later features included The Horse Whisperer (1998), in which he also starred; The Legend of Bagger Vance (2000) and Lions for Lambs (2007), in which he co-starred with Tom Cruise and Meryl Streep.